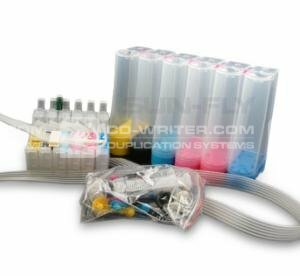 The Venetian Solvent Ink System using Eco Solvent Ink can print across many different surfaces without requiring any special coating or treatment. It is perfect for use with optical discs (i.e. CD, DVD, or Blu-ray), Security ID cards, Fabric, Paper, and many other surfaces. In addition to being able to print on a variety of surfaces, the Eco Solvent inks are also extremely water and scratch proof ensuring the printed image will endure day-to-day use or handling. The heart of the Venetian Solvent Ink System is a bulk Continuous Ink System (CIS) with 100ml exterior clear tanks, thus reducing the cost of printing to mere pennies per item. Because the ink tanks are clear, the user can tell at a glance if the ink is running low. This means never running out of ink again in the middle of an important job! Venetian . Light . Magenta . Solvent . Ink . - . 1l .